This is an old interview that has been republished for techradar's Movie Week. 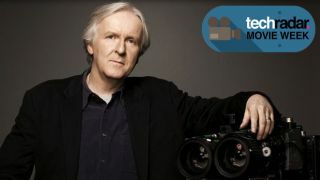 James Cameron is the biggest advocate for 3D working in Hollywood today. His hit movie Avatar kick-started a new wave of 3D movie-making, using techniques and technology that proved 3D could move beyond being a gimmick. Although it wasn't to some critics' tastes, the numbers do not lie. Not only is Avatar the best-grossing 3D movie ever made, it is the best-grossing movie ever made. The key to Avatar's success was that Cameron put 3D at the forefront of the film-making process, and he is now building a business out of offering his insight (and equipment) to other film-makers. The fruits of this could be seen at this year's IBC (International Broadcasting Convention), where the Cameron | Pace group, which he runs with co-chairman and cinematographer Vince Pace, announced it would be working with the BBC on a feature film of Walking With Dinosaurs, as well as announcing that Evergreen Films will be the first company with Cameron | Pace certification. "It's a theatrical motion picture so it will be in the IMAX in the UK and in digital 3D," said Cameron to TechRadar when we met up with him at IBC for an extensive chat on all things 3D. "We had a very good meeting with the BBC here, where we said we could be doing all kinds of things together." Walking With Dinosaurs is the biggest 3D production the BBC has undertaken, so it's good that the broadcaster has decided to do it under the tutelage of Cameron, who believes the Beeb needs to increase its 3D output. "The BBC has held back a little bit with 3D, where as BSkyB has jumped in and ESPN has jumped in. "The point I made to the head of BBC was that you can't hold back indefinitely. "You have to muscle in on this; you have to learn how to do this. This is what broadcasters are starting to wake up to, that 3D is going to happen." Although the BBC has only taken tentative steps into 3D production – as seen in this year's Wimbledon finals – Cameron does believe that the UK is well equipped for 3D and in some ways leading the way. "The UK isn't waiting for a massive install base of 3D sets in the home; Sky is going for the sports bars and the pubs. "That is a very creative solution and is one that can work all around the world." One of the ways Cameron is setting out to improve 3D is to offer up the Cameron | Pace name to productions that use the company's technologies. Like THX before it, it's set to become a symbol to consumers that the 3D in the movie they are about to watch is the best it possibly can be. But with the sales of 3D TVs not exactly setting the economic world on fire, Cameron understands that it sometimes quality isn't enough, you have to offer quantity as well. "We care about the quality of 3D, so we are looking to constantly improve it. But for the general public, the biggest improvement we can make for them is to give them more stuff. "They just want more stuff so when they do purchase their 3D TV set, they want to make sure that there is some programming to justify it." Alongside programming, the cost of installing 3D into your home is something else that needs to improve. Cameron believes that the introduction of passive glasses into the home could be key to mass adoption. "Instead of having to pay a premium at the cinema, the general public have to fork out on the glasses which are expensive," said Cameron to TechRadar. "Passive glasses are here and the quality is improving all the time. The fact that they are throwaway means this technology could be critical." Sitting down with Cameron it is clear to see that 3D isn't just a passion for the director, it is what he is fully focused on career-wise, so much so that it's hard to see him releasing a movie again without using the technology. Filming in 3D "never gets old"
"Vince [Pace] and I have been involved in so much 3D photography – we love it, it never gets old for us. "When we shot the recent Cirque du Soleil film back in December, we were in the truck looking at the images and saying to each other: 'Look at that! That's great!' We're kind of like kids. "In a way, though, I think we should look forward to 3D when it is less remarkable. In the same way we don't talk about how great the colour is on our TV sets any more or how great the colour is in a movie. "We need to get to that point of equilibrium, where the tail isn't wagging the dog." Unfortunately, since the launch of Avatar there's been a number of movies that have sullied the 3D format – one of which, according to Cameron, was Piranha 3D, a franchise that is linked to the director's early days as a film-maker. Cameron's first directorial gig was on Piranha Part Two: The Spawning. The franchise was given a tongue-and-cheek 3D remake in 2010 by director Alandre Aja and has spawned the brilliantly titled sequel Piranha 3DD, but Cameron was less than impressed with the results. "When you are watching a bad 3D movie in 2D and I was watching one the other night, this Piranha film, it was just bad storytelling in 3D, because everything would come to a stop and this grotesque thing would be sitting in the middle of the screen. "[The movie uses] these stupid 3D tricks that people used to think were good. And there would be one of these zingers every few minutes where everything would come to a screeching halt and some 3D gag would be hanging right in your face. "That's the 3D influencing the film-makers and not the other way around." Although Cameron doesn't get annoyed that films like Piranha make audiences question the quality of 3D – "The film didn't make that much money, anyway," he explains – he does note that 3D done right is the only real way for box-office success. "Good 3D that's done well in an integrated way and is an enhancement will make a film money. "Like Alice In Wonderland and the new Transformers, the 3D was done well on that, it was deep and integrated into the shot design."